Last weekend a few of us attended a Daito-Ryu day seminar with Grant Periott sensei and seniors from Tweed Takumakai ( http://aikinsw.com/ ), hosted by Redlands Aikido Yuishinkai ( http://www.redlandsaikido.com/ ). It was the first of what is hoped to be an ongoing dialogue and certainly was helpful in gaining further insights into Daito-Ryu, the fore runner of aikido and introduced to Aikido Yuishinkai through Maruyama sensei and named successor Okajima sensei. Grant sensei actually began studying Aiki arts through the Aikikai and the Ki Society before discovering his true passion was the Daito-Ryu, through the Takumakai. With this background he was able to relate elements of he practice to those of us dipping our toe into the Daito-Ryu water. Sensei began class by explaining the origins of the Daito-Ryu and introduced Sokaku Takeda as it middle founder, meaning it wasn’t he who founded the arts (they are recorded as coming form the Aizu clan) but it was he who brought them from a secretive clan based samurai art to within the reach of all classes and people of Japan. Ueshiba, is probably his most famous student who went on to found what would eventually become known as aikido. Peter sensei’s own school Takumakai is also a Ryu-Ha of the Daito-Ryu and was founded by Hisa Takuma sensei who received menky-kaiden (full transmission) from Takeda as well as holding 8-dan from Ueshiba? and 8-dan sumo (honary). Thus the art Grant sensei feels somewhat bridges aikido and Daito-Ryu. At the start of class he said it is important to understand what you are studying and change your mindset for that art because although Daito-Ryu and aikido are similar there are enough differences in mind and body that is important to understand the distinction to get the full benefit of training. 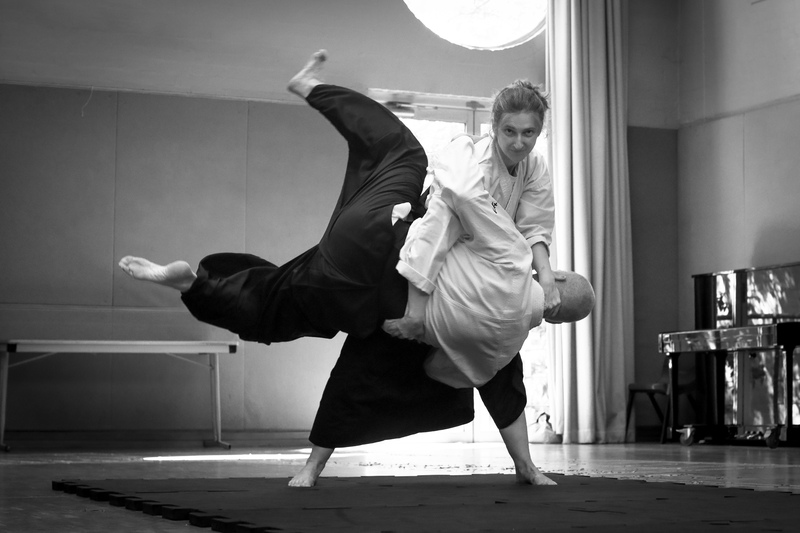 Studying a different style of aikido can be somewhat confusing though its the similarities and insights are what make it a beneficial. So too it seems being introduced to another Daito-Ryu school, the Takamakai after being grounded in Roppokai school techniques (through Okajima sensei) there were differences and similarities. Hard to put into words but where/when kuzushi appears, attacking the centreline and the elusive aiki-age and aiki-sage can all be seen afresh with quite a few ah-ha moments to be had. We also learnt that the Takumakai may form a study group/dojo next year and redlands dojo would be a good contact point to find out more.